While exploring the DS106 site of UMW, I found a rather interesting assignment posted by the professor; here is my attempt on it. Ever thought of creating your own dream room? Now you can! Using pinterest find rooms, furniture, colors etc. From there write a blog post about why you chose everything! This is your dream so make it as crazy and out of the box that you can think of! I am going to have my own home some day, and when I do, I’ll be decorating it to my liking. I would imagine my bedroom to look something like this–dark, dim, and pleasing to the eye. 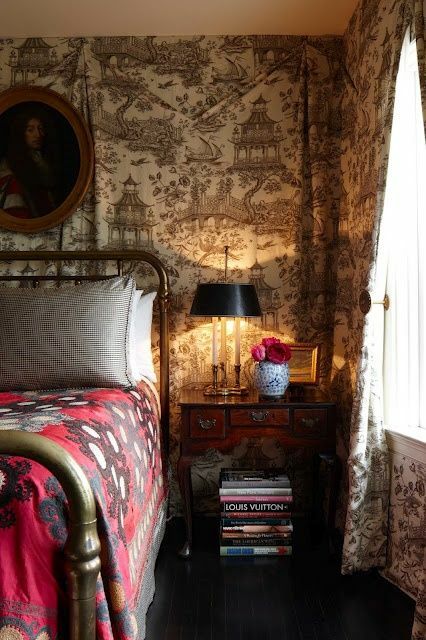 There would be wallpapers applied that suit the color of the bedroom furnitures, which would be brown, and there would also be some paintings attached on the walls to add the mood. After a day of work, this is where I’d like to be to get some rest. The wall paper is so vintage. I’m guessing the wallpaper is a curtain. Sooo unique! !